Oceania is a prog rock record. The songs might not be as long, but the sounds and the themes are just as portentous as all that dinosaur rock of the 1970s. And it's just as boring, too. Billy Corgan was once a man blessed. Gifted with great ideas and a band who could bear him just about enough to help him to put them into practice, the Smashing Pumpkins made a very special brew out of heavy metal sludge and dreamy pop. Not only did they serve up that sludge in a gloomy goth glass, they had the shameless audacity to take more from Black Sabbath than they did from Black Flag -- to top off their sound with technical ability instead of punky DIY spirit. Most importantly, though, they made golden, gleaming, and loud, pop songs. But the Smashing Pumpkins were a band cursed. They faced troubles like drummer Jimmy Chamberlain’s drug addiction, Corgan's own battles with depression, constant ego wars, and infighting that eventually tore them apart. 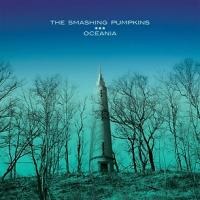 Billy Corgan promised us that Oceania would be the record that got the pumpkin rolling again after years of stagnation. But we all know that the band behind Oceania isn’t the same band that made Gish, or Siamese Dream, or Mellon Collie and the Infinite Sadness. It’s not the same group of people, and the music just doesn’t have the same personality. Indeed, Oceania tries very hard to be a prog rock record. The songs might not be as long as those found on your typical prog rock album, but the sounds and the themes are just as portentous, and it's just as boring, so there’s no escaping the fact that it owes a big debt to all those concept albums made in the 1970s. Billy Corgan conceives of Oceania as an album-within-an-album, a compartment in the mammoth, 44-song-long concept album Teargarden By Kaleidyscope, which is based on the Tarot. Yeah, seriously. Where the supposed “spiritual” content begins or ends isn’t clear. What is clear, however, is that Corgan seems to think that he’s giving us an insight into the vertiginous impossibility of the act of creation and of the terrible impurity of the created thing. But all this talk of mad spiritual meta-albums really does is confuse the cockles out of us before we even start listening to it. Billy Corgan has given these songs baffling titles, like “Inkless” and “Glissandra”. And even the songs named after recognisable phenomena like “Quasar” and “Panopticon” and “Oceania” and “The Chimera” don’t seem to mean anything here. Fortunately, though, there are enough massive, muscular guitar riffs here to make us forget about all that. Opener “Quasar”, much like “Cherub Rock”, builds up and up and up before breaking into a steel girder of guitars. But its intensity is compromised by how unnatural – how computer-generated – it all seems. And that’s Oceania’s central problem: it seems strangely inhuman. Billy Corgan has made sure that Oceania is a high-tech affair from start to finish. But that hi-tech inhumanity also seems to express a nostalgia for the analogue prog rock past. It’s almost as if Corgan and co-producer Bjorn Thorsrud relish the technological advances that allow them to make the guitars sound psychedelic – stickily swirling on “My Love Is Winter”, like melted rocks on “The Chimera” – while at the same time pining for being unable to make that psychedelic seem as authentically rough and ready as it did back in the day. The synthesisers do not help on this front, either. Sometimes they sound like retro sci-fi, as if Rick Wakeman himself played them, like during the opening of “Violet Rays”, throughout the long nine minutes of “Oceania”, and on “My Love Is Winter”, in which even the drums have phasers on them (set merely to stun, of course). And Sometimes, those synths even sound unsustainably New Age-y, like shrink-wrapped flower-power (“One Diamond, One Heart”, “Pinwheels”). And sadly, all of this technical and stylistic wizardry overshadows what should be really important, like, you know, the melodies, and, er, the songs, and the structure of the album itself. Billy Corgan can’t ever quite muster up the magic of the Pumpkins’ early years because, to be honest, the songs just aren’t good enough. The second half (“Pale Horse through to “Inkless”) is much better than the first, but most of these songs seem totally unsure of themselves. “Quasar” seems to drag on for way longer than its measly four minutes, and it spends much of its running time switching up and changing direction without warning. The attempts at earnest acoustica on “My Love Is Winter”, “Pinwheels” and “The Celestials”, which all-too-predictably surges into overdrive after the halfway mark, are just a bit of phoney baloney. But, then again, can we really expect anything better from the Smashing Pumpkins at this stage in the game? Can we just about manage to forgive Corgan for his trespasses (the retro revisionism, the going-nowhere guitar solos, and the godawful song titles) simply because he seems to be trying so gosh-darned hard? Perhaps. But make no mistake, we’re not asking these questions of the band the Smashing Pumpkins, because Oceania is not a record by the band the Smashing Pumpkins. No. Oceania is a record by the one-man-band Billy Corgan. The whole thing’s about Billy Corgan this and Billy Corgan that. The Smashing Pumpkins might have other members, but you wouldn't know it.